Our hopes and fears are the same as every other parents’. The future we want for our children is one in which they are independent, happy and able to participate in society as equals. Isn’t that what everyone wants? Some may call it emancipation, a word that has a general meaning for adults and another, narrower one for children wanting to take control of their lives. In either case, emancipation is best thought of as a long process which, for best results, should begin as early as possible in a person’s life. It was the very first piece of advice we received when our daughter Lucia was diagnosed with autism, aged three. 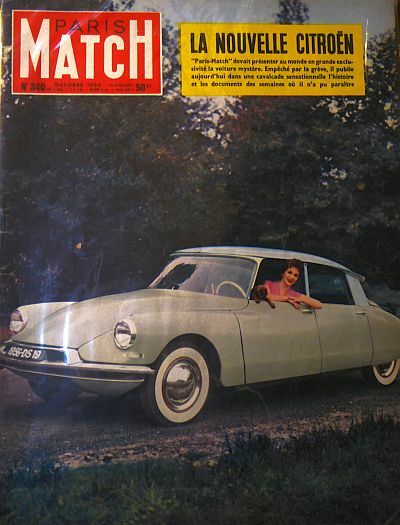 In fact, it was delivered to us at the same time as the diagnosis. ‘Teach her to be independent as soon as you can. Start now.’ We took it to heart. It begins in your social circle, with the people that surround you. It is grounded on a set of shared values, chief among which is that every person has a right to belong, to be included. You have a relative degree of control over this environment and make it a place where a desire for independence is nurtured. But true independence can only be measured against the wider society, which in the case of disabled persons is dominated from the outset by several layers of institutions: health services, social services, schools. You have little or no control over these. Luck plays a major part, as do your personal means and circumstances. 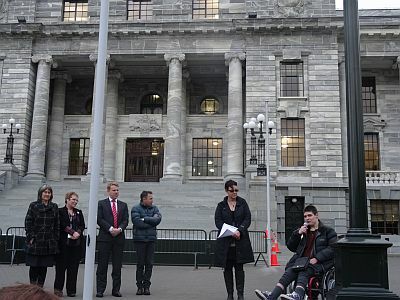 Disparities of expectations and treatment are enormous, and the experience of most people who raise disabled children in New Zealand is one of constant and exhausting struggle against one or more of these institutions. Sometimes all of them at once. I have written about this many times. We keep having to say these things. So this week for a change we’re going to rally. You may have heard of the latest raft of changes to what used to be called special education. First of all, our education authorities decided to do away with the name. That is a fine idea in principle. Advocates eschew terms like ‘special education’ because it is overtly exclusionary. When the institution does it, however, this ‘making everyone the same’ only works so long as the principles of inclusion are truly embraced. Otherwise, it becomes a tactic to make first the disability, then the person invisible. 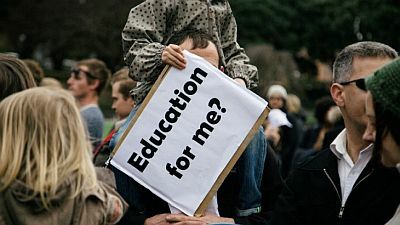 The main plank of the ministry’s new plan is to shift spending to early education, with the expectation that it will reduce spending later in the educational life of the child. This, too, is a fine principle. It’s just not a principle that can be left in the hands of the people who for twenty years have refused – and continue to refuse – to do something as basic as counting our children. Every consultation in this area works in the same way: parents and educators are assembled in front of a ministry facilitator in firm control of the agenda and the term of the exercise. 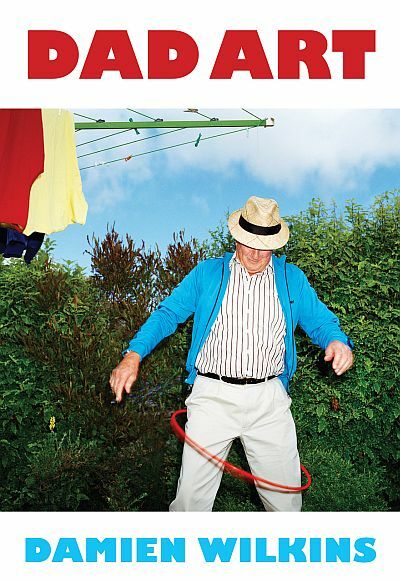 The exercise is always the same: to tinker at the edges of a system that works just fine. The outcome is also always the same: parents and educators pointing out that the system as is being described to them is very different from the real one, in which under-resourcing and exclusion are the norm. But the exercise has no box in which to put these contrary opinions. None of the group activities allow for participants to take over and set the terms. The voices of students are the least frequently heard of all. And so over time two realities have been allowed to develop. The official reality carefully constructed by government by studiously refusing to conduct proper surveys, and by teaching school administrators the language they should use to self-assess as being inclusive (so that the system as a whole, in turn, can describe itself as such); and the reality reported by teachers, students and families. The lack of funding for proper studies allows government to occasionally dismiss this second reality as ‘anecdotal’. However, the few times that people are actually called upon by the institution to give evidence – as in the case most recently last year of the enquiry into the supports for dyslexia, dyspraxia and autism – it becomes clear that this second reality is far closer to the lived experience of students with disabilities. This is what enables the likes of David Wales, the National Director for Special Education, to claim that this latest plan to shift resources to early intervention will not result in any of the older children missing out. This is an entirely paradoxical position. Since we have already been told overall funding will not increase, of course older children will miss out: a blanket is being pulled, and we’re not getting any more blanket. 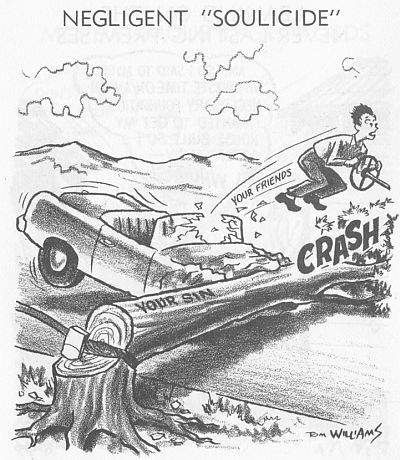 But – and this is the beauty of the plan and the genius of the bureaucrat – the early intervention will reduce the need, as judged by the people in charge of telling us that things have been fine all along. The special kids will stop being special. They will be cured of their life-long disabilities by a subtle change in the modelling. At no point will they or their families be asked to determine what inclusion means to them and how it should be achieved. This degree of freedom cannot be given to us. 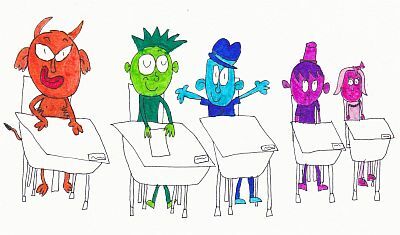 We asked our youngest son, who also has autism, to draw a picture of children at school together. It was his school’s principal who had the idea that he may help us illustrate our campaign. Ambrose, who is eight years old, thought of children of different colours and shapes. His understanding of his own difference is still forming. In so many ways he’s one of the lucky ones, and still things are very hard for him and for us. That they might get worse doesn’t bear thinking about, but we have not given up on the radical idea that they should get better. Help us by joining us this Thursday afternoon at 4.30 on the grounds of Parliament. It will be a family friendly event, and we need as many of you as can make it there with us. Well, we did rally, and I'm happy to report the turnout was great and the event very successful. 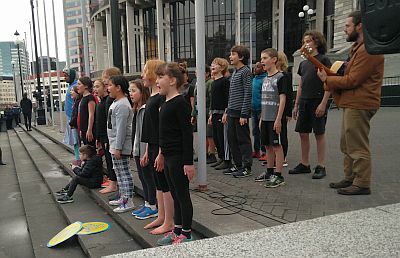 We got coverage from TV One and Radio New Zealand (audio, text) and support from a number of organizations including the Green Party. Below you'll find the open letter that Catherine Delahunty, Chris Hipkins and Tracey Martin pledged to table in Parliament. (Mojo Mathers was there too.) It forms the basis of a petition which I would beseech you to sign here. I also strongly encourage you to watch Etta Bollinger's speech, which perfectly sums up the reasons for our rally and the road ahead. Here are a couple of pictures of our school's kapa haka group, including my daughter. 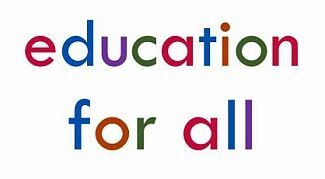 The Education for All network is made up of disabled people, families, educators and service providers. We are disappointed and frustrated at the continued lack of commitment to ensuring that disabled people have access to a properly resourced and inclusive education. Meeting New Zealand’s international human rights obligations and our own legislative requirements to provide every disabled person with an inclusive education. Putting an end to children, families and schools having to compete against one another for funding. Removing the disincentives for schools at all levels (i.e. ECE, primary, secondary and tertiary) to enrol and include students with disabilities by providing proper resources, supports and funding. Adopting a policy of universal design for learning so that everything, from the built environment, curriculum, teaching practices and support services, is accessible for everyone. Working with the disability community, families, educators and service providers to implement a system that works. Once again: sign the petition! For a recent independent view of the supports for children with disabilities in our schools, see the report released earlier this month by Youth Law Aotearoa. 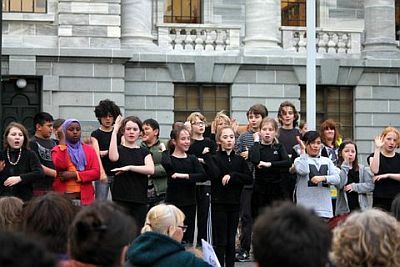 I recommend also two write-ups before the rally, by Tess Casey of Inclusive NZ and at the indispensable Autism and Oughtisms. Halfway through preparing for our panel on the future of journalism I realised that, after dispensing with the introductions, I had only set out to ask leading questions. I tried to soften the effect somewhat. I needn’t have bothered: my three panelists were all experienced and headstrong enough to bend each eager invitation to the point they wanted to make. As well they should have. But there is one pointed suggestion I regret not making. When I left the question of why journalism is good for democracy wide open, I was hoping to be told that it’s not only investigative journalism that matters, nor political reporting. Feature journalism matters to the democracy as well. So does art criticism. So do book reviews. Anything that holds a mirror to our social and cultural life. Anything that tells us facts about ourselves. I had never been to Going West before. Hell, I had barely been to West Auckland. The festival has existed for over two decades. I understand it used to take place on a train – hence the name – but nowadays it is hosted at the Memorial Hall in Titirangi. After the few days we spent in Point Chevalier three or four years ago, I’m reminded again that large chunks of Auckland are small and highly characterised little towns. I’m also reminded of what Melissa Lee said about the motorway keeping South Auckland criminals out of Mount Albert. I’m not used to suburbs being sealed off from one another, or be thought of in this way. Before leaving Wellington, I look up on Google Maps the place I’m staying and a friend’s house. The distance is listed as 15 minutes by car and over two hours on foot. This is a city with a strange, elastic geography. But I was here for the book festival. Due to a tumultuous couple of weeks, and to the usual nerves which overtake me whenever I have to perform in public – for the second time this year, I’ve had to fill out a tax form using the hilariously implausible description of “entertainer” – I was only dimly aware of the programme, save for Barbara Brookes, Anthony Byrt, Damien Wilkins. 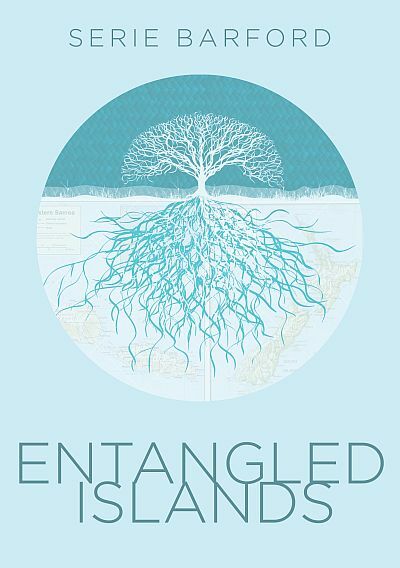 So it was that on the first night, feeling jet lagged after an hour-long flight, I was treated in succession to a 20 minute poetry reading by Emma Neale, a lecture by Albert Wendt, and a full show by Michelle A’Court. All of that, in a small auditorium largely filled with ageing locals. Which is no slight: this is the typical audience for these events, and whatever assumptions you may want to make about their social extraction or their politics, it quickly transpired it was not a group of people that minded being challenged. Increasingly, I find that this is my dimension, too. I am attracted by the small events filled with excellent people. One could say many things about how far the initial, easy familiarity that New Zealanders offer can be taken, but that lack of social distance at times like these is a simple, palpable reality. You can talk to most anyone, and if you can talk to people it means you can work with them. This, too, I’m growing more accustomed to. 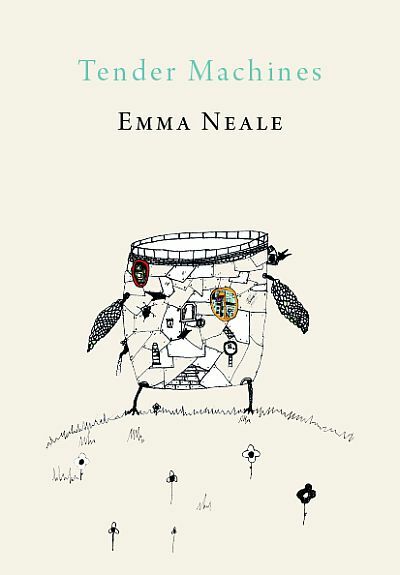 Emma Neale was a discovery, but so was Serie Barford. 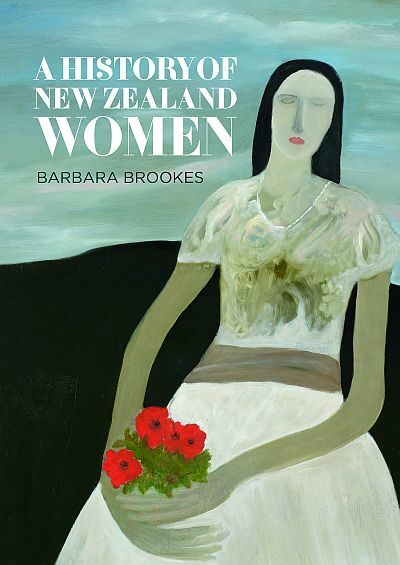 Listening to Brookes talk about her History of New Zealand Women was a joy, as were Damien Wilkins’ excerpts from Dad Art. I had never seen anyone advocate more forcefully and clearly for a drastic change in our environmental policies – that is to say, in our economy – than Mike Joy. 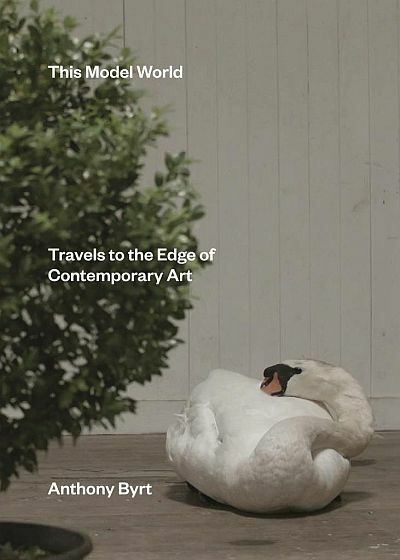 Anthony Byrt, as he did two weeks ago in Christchurch, came across as one of our sharpest thinkers not just on art but cultural criticism more generally, and I can’t wait to read his book. Then there were David Gellar, Marama Muru-Lanning, Sue Orr. And Paula Penfold, Sara Vui-Talitu and Simon Wilson, even if they didn’t say the things I was trying to get them to say but rather the ones they wanted to say. It’s hard not feel invigorated and a little hopeful when you come away from these events. And fortunate that you could attend, and happy that they are so accessible for a relatively large number of people. There’s some cultural life-blood in this place yet. 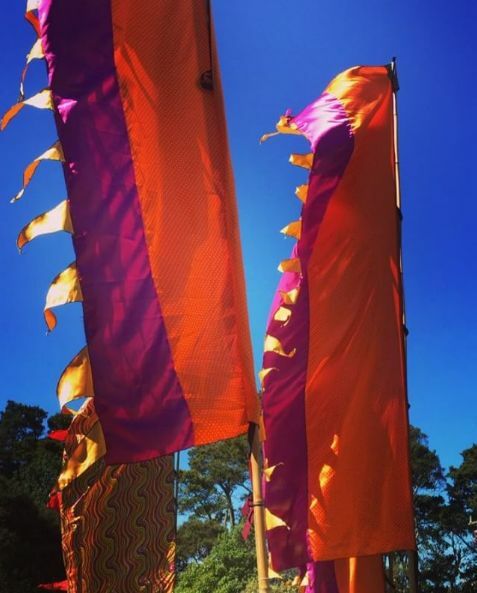 The image at the top of the post is from the festival’s Instagram page. The Wellington launch of our book (number five in the best-seller list!) is this Thursday from 5.30 to 7 pm at the Whitireia Journalism and Broadcasting School, 86 Vivian Street. Tess McClure will chair a panel with Cate Honoré Brett, Nicky Hager and Peter Griffin. The Facebook event is here. 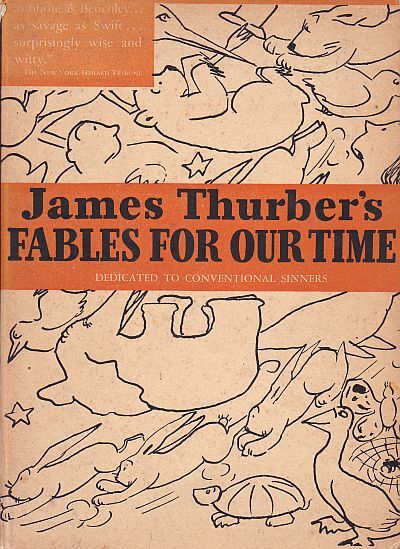 Strange tales of moral instruction. See if you can make sense of this cartoon. 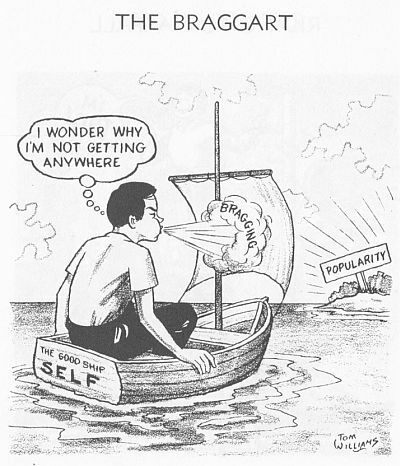 Or there is this one, about the braggart whose bragging won’t help him become popular. 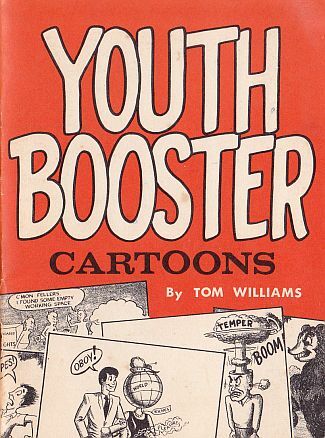 The cartoons come from a trilogy of books by one Tom Williams, part of this year’s second-hand haul that is the traditional subject of my blog anniversary posts. 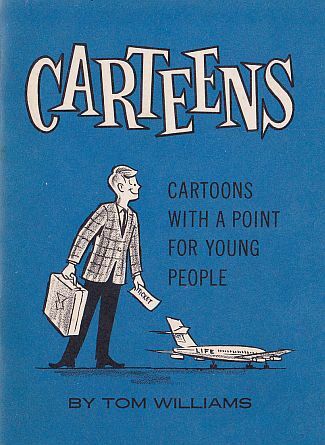 It can be difficult to date these sort of books, as their aesthetic is stuck into a generic 1950s American everywhere, but I can tell you they are late additions to the genre. 1973. Hand-stamped by the US censor (#12,406) and bearing the markings of the Geneva Branch of the War Prisoners Aid World’s Committee of the YMCA, over which in 1946 this sticker was affixed, in three languages. 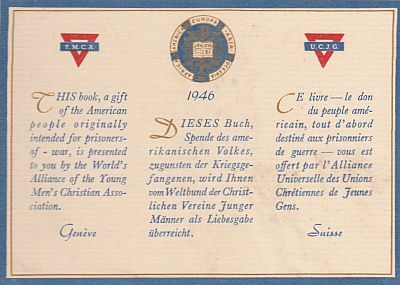 This book, a gift of the American people originally intended for prisoners-of-war, is presented to you by the World’s Alliance of the Young Men’s Christian Association. Which rather leaves me wondering: you who? Nobody wrote their name into the book, prisoner or otherwise. All I know is that it ended up in New Zealand and was later donated to the Downtown Community Ministry. This year – for the second time running – I was out of town during big book fair weekend so it was Justine who attended. 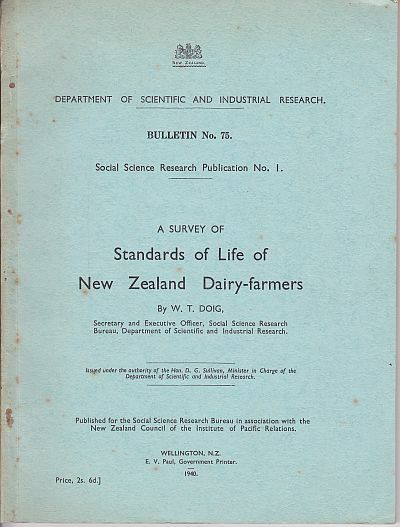 This highly technical 1940 government report on the welfare of dairy farmers proves that she knows the way to my heart. 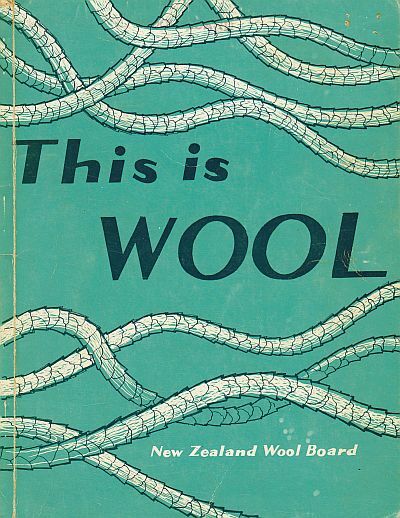 As does this beautifully illustrated wool monograph. 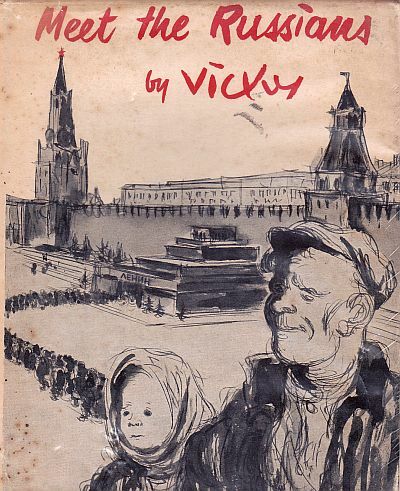 Or this peculiar collection of sketches form the Soviet Union by another cartoonist, Vicky, first published in the year of Stalin’s death. Here’s a drawing from a school, in keeping with the theme of the past few weeks. 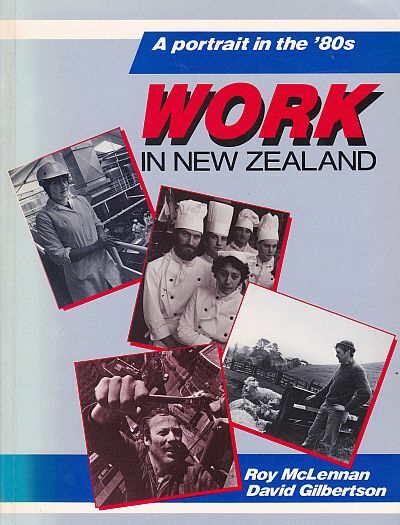 Or this book on work in New Zealand, fatefully published in 1984, which naturally made me think of Richard Scarry, and in whose company I expect I will spend some absorbing hours. 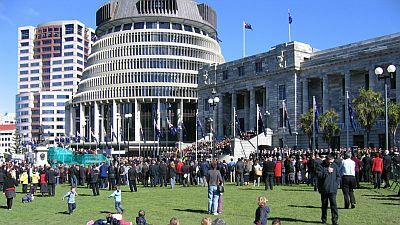 Speaking of 1984, during my time in New Zealand I have heard various people claim that when the fourth Labour government came in nobody was to know what they would get up to, which has always struck me as highly improbable, even though god knows they didn’t campaign on half of what they did do. 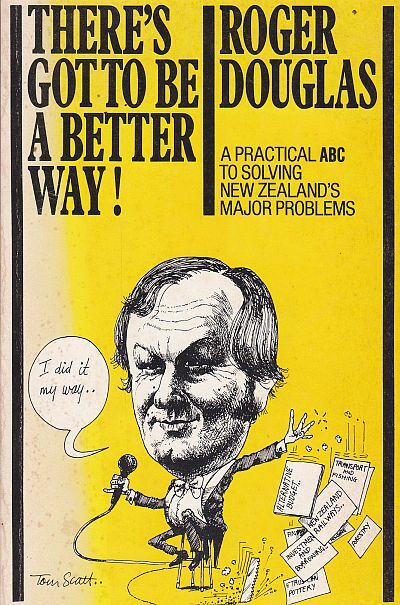 But Roger Douglas had made no secret of his more radical ideas and now I can wave this promotional pamphlet at people. It dates as early as 1980. Seriously folks it’s all there – his approach to unions, investment, business regulation, reducing government, introducing a sales tax, abolishing the estate tax. He spoke like a right winger and, big surprise, ended up acting like one. Who could have known? 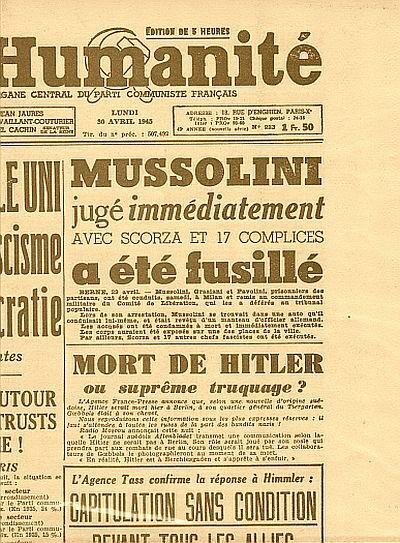 And also the evening edition of l’Humanité of 30 April 1945, bearing a few days’ old news of the death of Mussolini and extremely fresh news of Hitler’s suicide. Also, the war in Europe was over. Not what you would call a slow news day. Another thing I do at this time of the year is inaugurate a new banner artwork. Faithful readers will know that Marian Maguire is one of my favourite artists, and I hesitated for a long time to ask her but she said yes and so I’m delighted to show off the picture at the top of this page. We farewell therefore Sarah Laing’s second banner. Which came after her first. 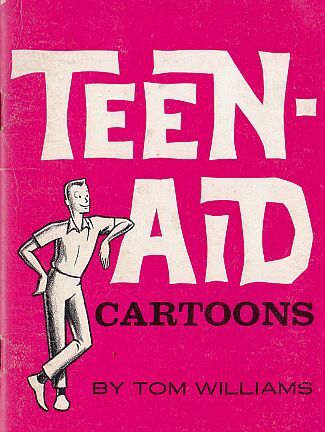 Which followed on from Tim Denee’s. 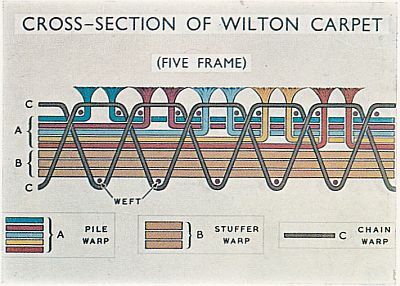 Before whom Shirley Carran ruled the page for three years. 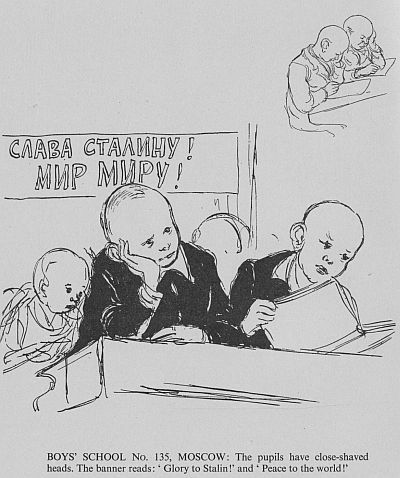 And it was Bert Warter’s original 1940 illustration to Bruno Furst’s book Stop Forgetting which started the whole thing off. Finally: the last year of posts in mosaic forms. Thank you for reading, as always.